NEW YORK - Why did they weep so? That was the question that came to director Alex Gibney's mind when Apple CEO Steve Jobs passed away in 2011, at age 56, from cancer. People across the globe cried and left poignant memorials to Jobs, at Apple stores and online, testifying to their love for a man they never met and for the technology he helped make part of their daily lives. Gibney said that Jobs' affinity for making technology personal and vital was key to his great talent as a storyteller: "Jobs was very smart in understanding how to make the computer personal. We have become part of our computers, and our computers have become part of us. "Having been on that journey with us, the fact that he's gone is very upsetting because there's nobody else around like that. [He] is not able to tell us any of those stories. And there's nobody around, we think, that can fill that role." The new documentary,"Steve Jobs: The Man in the Machine," is the latest work by Gibney, the Academy Award-winning writer-director behind such films as "Taxi to the Dark Side," "Enron: The Smartest Guys in the Room," and "We Steal Secrets: The Story of WikiLeaks." In a circular fashion -- beginning and ending with the Apple CEO's death -- the film traces the life of Jobs; the contradictions of the man which made him such a beguiling and frustrating public figure; and the impact he had on society and on the few who knew him very well. And, most tragically, his own hubris about treating (or not treating) his cancer, which precipitated his death at an early age. One of the most piquant aspects of Gibney's entirely engaging and very moving film is how Jobs stirred passionate feelings of both adoration and anger from the people who knew him best. Even those who were hurt by Jobs' management practices or personal rebukes spoke very emotionally in the film of their fondness and gratitude to him. Gibney, whose most recent film, "Going Clear," examined the cultish aspects of Scientology, found a similar "Cult of Mac" among consumers whose adherence to all things Apple resembles a religiosity. "There is a passion in the person and the products that is so deep that any criticism cannot be tolerated -- that I do find interesting," said Gibney. "Why should that be? Is it not possible that we can discuss how pitifully paid are the workers in China and how badly treated is the environment there, even as we admire the technology aspects of Apple products? There seems to be a need to deify that stuff in a way that brooks all criticism, and that does verge on a religion. "There are certain parallels with Church of Scientology! But I'm not aware of people from Apple who show up at your doorstep and try to intimidate you in that way." Jobs' life has been written about and dramatized numerous times (in documentaries, biographies by Walter Isaacson, Karen Blumenthal, and Brent Schlender & Rick Tetzeli, and in bioflicks starring Ashton Kutcher, Noah Wyle, Justin Long and Michael Fassbender). Gibney's take is personal; as a longtime, satisfied user of Apple products, he's had one foot in the "Cult of Mac," although the "man behind the curtain" of Apple intrigued the journalist to explore how he maintained his aura. As such, we do glean new and intriguing aspects of Jobs' personality, and can understand why he stirred such strong emotions, using his power, personal magnetism and unceasing confidence to sway, motivate and win over his audiences. Gibney also questions Jobs' professed antipathy for philanthropy -- the polar opposite of Jobs' great rival, Microsoft founder Bill Gates. "Gates in his later years is doing a lot to improve the lot of all of us by putting his money where his mouth is. Jobs said, 'Giving away money is a waste of time.' Hard for me to understand that. "For the film I wanted to look at a child of the counterculture who in his search for fame and power took some things from the counterculture and left other things behind," Gibney said. "Same with Zen Buddhism -- he took some aspects and ignored others." "He felt his focus was to make great products, but it was the focus of a monk without the empathy. He wasn't interested in that other stuff. His job was to make great products, and f--- everything else." Jobs exuded that attitude of a monk in a life which, to most observers, appeared stripped of all emotional and material connections not related to Apple products. As Gibney's film illuminates, the man who helped people the world over connect with one another -- their faces reflected in the shiny surfaces of their iPhones and iPads -- had a pretty difficult time connecting himself. 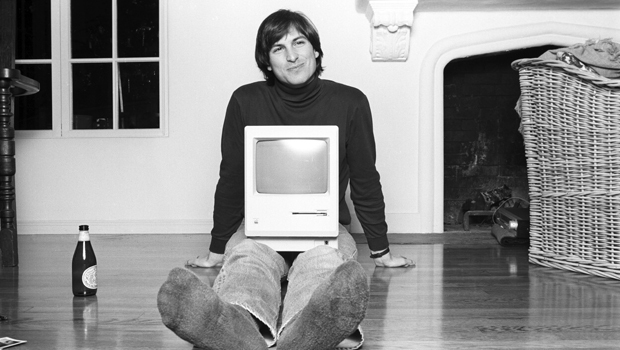 "Steve Jobs: The Man in the Machine," released by Magnolia Pictures, opens Friday, September 4, at theatres across the U.S. (Find a screening location here.) The film is also available via Video On Demand and iTunes. The film is rated R (for language).